"Our bi-annual town election will be in 2 weeks – on Tuesday, November 7, 2017. The polls (at the high school) will be open from 6 AM until 8 PM; school is closed that day, so parking won't be a problem. There are more than 22,000 registered voters in Franklin, but on average, voter turnout for town elections is less than 20%. But these are the elections that have the most direct impact on you, and the elections on which you have the most impact - if you choose to participate. Consider: Local elections can affect some of the taxes you pay, help determine which employers move to your area and which ones already there will stay. They can affect things like the kind and number of pets we keep, how you build or add on to your house, and services like trash pickup, water, sewer, police, fire, teachers, schools, roads, parks, playgrounds, sports fields and even rules about yard sales. If you don't take the time to learn about and select the people running the town, it's a lot like handing your wallet to a stranger and saying "I trust you will do the right thing with my money." Local cable TV and social media has made it easier to learn about the local candidates, and many of them participated in last week's candidate forum (available On-Demand if you missed it). The Milford News is profiling the candidates, Franklin TV is posting videos, and the candidates have generally made themselves available for questions and discussions. 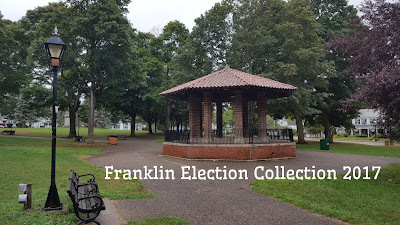 We are also EXTREMELY fortunate to have Franklin Matters (Steve Sherlock) conducting and posting in-depth interviews with the candidates in Franklin Matters (Facebook, blog, daily email). Generally, more than 80% of our registered voters turn out for presidential elections, and roughly 60% for state elections, but we average LESS THAN 20% for local elections. While state and national elections are certainly important, your vote in a local election actually counts for a whole lot more than your vote in the national election. There is no early voting for local elections, but absentee ballots are available."